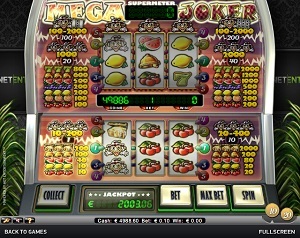 Mega Joker is a classic online video slot machine game from Net Entertainment that was released in 2009. This video slot game has 3 reels and 5 pay lines. The theme of Mega Joker is based upon one of Net Entertainment’s super-hit slot machine game Jackpot 6000. In fact, Mega Joker is deemed to be Jackpot 6000’s big brother! Numerous online slot players love playing this slot machine game as it brings out a genuine impression of a real land-based casino slot machine in every way. It may not look very interesting for a lot of players at first glance, but once they got to play with it, they admitted that they have enjoyed playing this classic yet addicting slot game. #1 Basic Gameplay: Simply bet from 1 up to 10 coins in the basic gameplay. At bet 1, the bet line 1 is enabled and winnings there will be automatically collected. At bet 10, all of the 5 bet lines are enabled, and you can either collect your winnings or play them in the Supermeter Bonus Feature game. #2 Supermeter Bonus Feature game: This is only triggered if you win with a max bet of 10 coins. Bet 20, 40, 100, or 200 coins (at the pre-selected coin value), and all the 5 pay lines will be automatically selected. The maximum prize in the Supermeter Bonus Feature (excluding the Jackpot) is 2000 coins! #3 Random Progressive Jackpot: Mega Joker features a random progressive jackpot for its valued players! The more you bet, the greater your chances of winning the Jackpot! All in all, Mega Joker is pretty much like a classic no-nonsense slot machine. Simply spin the reels and hope for the best to land on a winning combination. However, you will see that there are some buttons on this particular slot game that are not found on the usual classic 3-reel slot games such as Collect. This button is essential for the special features provided in Mega Joker. A nice facet about Net Entertainment is that they let everyone play instantly on their online slot machine games, without the need to download anything at all! With a Supermeter Bonus Feature game that pays up to 2000 coins, no fancy rules to remember, and a random Progressive Jackpot up for grabs, Mega Joker is definitely an online slots player’s ideal classic slot machine game! Even if Mega Joker looks like a pretty simple online video slot game, Net Entertainment does their best to satisfy each and every one of their valued slots players. The graphics are simple and easy to understand. When you play the game, you will notice that the outside of the reels have potted plants on both sides, which kind of looks like you are in a casino room corner. Mega Joker looks like the traditional slot machine that you see in land-based casinos. Since it is essentially a no-frills type of slot game, Mega Joker has been designed to mimic a genuine casino ambience with matching sound effects, which makes you more convinced that you are in a real casino playing an old-school slots game. The casing of the reels includes the reels, buttons and the Supermeter (on the top). The icons or symbols used will make you feel nostalgia as it includes cherries, lemons, watermelons, oranges, sevens, bells and the Joker symbols. The overall graphic design of Mega Joker displays colors such as green, red, yellow, violet, purple, and of course, gold. Since it is a fairly simple slot machine game, Mega Joker does not have too much sound effects. There is no background sound constantly being played. When you click on the Spin button, you will hear a sound similar to the slot games that are on a real land-based casino. When you hit a winning combination, you will hear lively arcade-type celebratory music as you get paid out. Mega Joker is designed to be a fairly simple slots game with 2 types of gameplay: the regular Mega Joker slot game and the Supermeter Feature slot game. In the regular Mega Joker slot game, there are only 6 regular symbols available such as the Watermelon, Lemon, Cherries, Bell, Treasure Chest, and of course, the Joker. In the Mega Joker Supermeter Feature, there are 8 symbols available such as the Watermelon, Lemon, Cherries, Orange, Grapes, Bell, Seven, and (again) of course, the Joker. Mega Joker does not have any Wild or Scatter symbols. Mega Joker does not have a standard Bonus Feature game (such as free spins), but they do have a Supermeter Bonus Feature game to award online slot players who would like to truly try out how far their luck goes! The maximum wager is needed for you to qualify for the Supermeter Bonus Feature game. Do take note that in the Supermeter Bonus Feature game, the stakes are higher – the betting level is automatically 10 (max bet); you can bet 20, 40, 100 or 200 coins in the Supermeter Bonus Feature game, with all of the 5 pay lines enabled. In the Supermeter Bonus Feature game, all of your Supermeter credits are stored in the “Supermeter” (above the slot machine). The Supermeter winnings are paid out according to the Paytable that is already displayed at the top left and right portions of the Supermeter reels. Please take note that if you wager 100 coins, you will be given a Mystery win of between 100 and 2000 coins when you get a Joker symbol in the middle reel; if you wager 200 coins, you will be given a Mystery win of between 100 and 2000 coins if you manage to get one or more Joker symbols in 1 or more reels! The maximum win you can achieve in the Supermeter Bonus Feature game (excluding the Jackpot) is 2000 coins! If you win simultaneously on different bet lines, all of these are added (applies to both the regular Mega Joker slot game and the Supermeter Bonus Feature game). The Mega Joker slot machine game also features a Random Progressive Jackpot up for grabs! The more you bet, the bigger your chances of winning the Jackpot! The random progressive jackpot is described as a continuously-accumulating prize, and the most recent value of the Progressive Jackpot is showcased in the Mega Joker slot game. In order for you to be eligible for the Progressive Jackpot, you must bet a maximum of 10 coins per spin. Every time a slot player plays the Mega Joker slot game, a portion of their bet is included to the Jackpot. The random progressive jackpot can only be won when you wager the maximum bet. Do take note that only Real Money Players are qualified to win the Mega Joker Random Progressive Jackpot. Mega Joker is an online video slot game that has 3 reels and 5 pay lines. The minimum bet is 0.10 and the maximum bet is 1.00 per line. Mega Joker does not have an Autoplay function. The reason is most probably because the spinning action is quite fast-paced that it would sort of mess up the flow of your game play.